Medication compliance and adherence are critical factors to understanding clinical trial success. In a randomized trial, ensuring that patients are taking their medication is an important quality step for investigators. Bracket has announced the addition of an SMS text messaging component to our Bracket RTSM platform. This platform will be used to issue Patient Reminders via SMS and help keep patients compliant throughout a clinical trial. SMS text messaging has shown to be a useful intervention for improving compliance and adherence in numerous published studies. 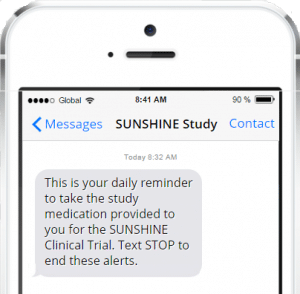 Diabetes, psychiatry, and gastrointestinal studies are just a few that have shown patient compliance can be improved through daily SMS reminders. Bracket SMS Patient Reminders are managed through our Bracket RTSM platform. All messages and patient data are encrypted and stored safely. The service is available globally, and the reminders can be tailored to specific dosing regimens and communications types on a study-by-study basis. For more information on how you can utilize SMS Patient Reminders in an upcoming study, please contact Bracket.